That's life's blessin', darling. It always goes on.- I wish I could remember where I read that. No matter what happens, life goes on, which can even be jarring sometimes. Whether You got your heart broken one too many times, lost your job or can't even find one to begin with, there always comes the moment when You have to look facts in the face: life goes on. And this means we have to eat. So, regardless of all the chaos that's made its nest in my life and ignoring all the little worry worms that pester me constantly, I'll be continuing to cook and to tell You about it. Hey, You read blogs at your peril. But since I'm still adjusting to the situation, I'll start with something simple. I believe this is actually the first soup recipe to appear here on KW. In a pot of a sufficient size (depends on how much soup You want to make), heat up the olive oil. Dice the onions and put them into the pot. While the onions cook, dice the carrots and the celery root (yes, yes, You need to wash and peel them first. Thank you, Captain Obvious ) and add them to the pot. Fry all the vegetables for a moment, but be careful not to let the onions brown. When onion browns, its taste changes and we don't want that here. 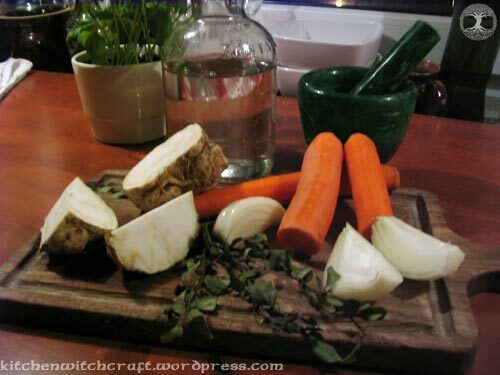 So keep on stirring the vegetables on the oil for a while - preferably until they get a pale-gold sheen, or the onions are on the verge of browning - and when You feel they're ready, pour the water in. Now all You need to do is keep the pot on the stove, boiling, but not too violently. 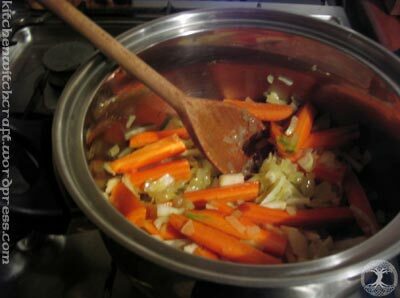 The vegetables need to be soft enough to mix smoothly, so the best way to go about this is to keep the pot over a small fire, cover it and go read something for about an hour. If You're not using a blender, boil the vegetables longer - the softer they are, the easier You can run them through a sieve (basically You just fish the big bits out with the sieve, and then rub them around it with the pestle until they mash). If You have a blender, You can shorten the boiling phase. 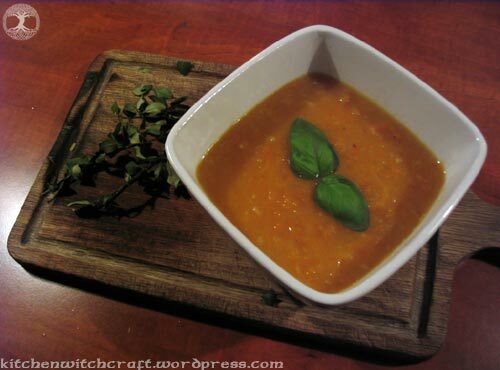 Mix the soup in whatever way You deem appropriate, then, and season it to suit your taste. It works best with fresh, aromatic herbs such as basil, mint or rosemary, with some pepper to spice things up. This is quite a nutritious soup, but it does not rest heavily on the stomach. It can be used as the first course if You're planning some heavier dishes later. For health reasons, it's definitely worth recommending to frequent computer users, just like every other carrot-based meal.